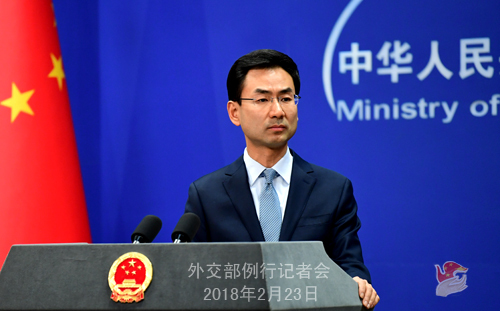 Q: Director-General Zhao Bentang of the Department of Latin American and Caribbean Affairs of the Ministry of Foreign Affairs of China will meet with his Russian counterpart Shchetinin Aleksander Valentinovich and hold relevant consultation in Beijing on February 26. What would be the main topics of their consultation? 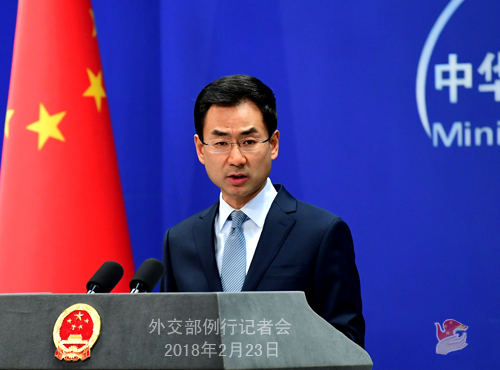 A: As part of the consultation mechanism between the two foreign ministries, the China-Russia consultation on Latin American affairs has been held for ten rounds since 2001, contributing to better mutual understanding and China-Latin America and Russia-Latin America ties. 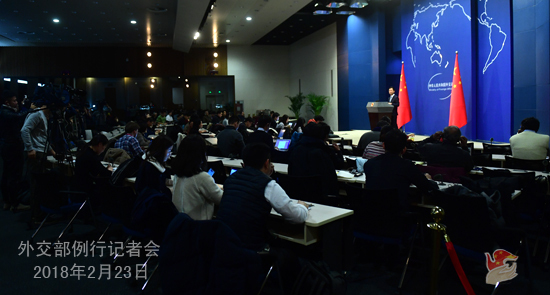 The two sides agreed at the last round of consultation to hold the 11th round in Beijing in the near term to exchange views on the situation in Latin America, China-Latin America and Russia-Latin America relations. Besides Russia, China also has such kind of consultation mechanism on Latin American affairs with the ROK, Japan and the US. Q: According to reports, the China-Kyrgyzstan-Uzbekistan highway will open to traffic on February 25. Can you give us more details? A:China, Kyrgyzstan and Uzbekistan successfully carried out a trial operation of the International Road Transport of Goods along the route Tashkent-Andijan-Osh-Irkeshtam-Kashgar from October 30 to November 1, 2017. Based on that, the three parties plan to officially put the International Road Transport of Goods into operation within this month and are stepping up efforts to achieve that. The China-Kyrgyzstan-Uzbekistan highway is an important connectivity project for this region. China would like to take this opportunity to enhance its transportation cooperation with Kyrgyzstan and Uzbekistan so that the Belt and Road Initiative would deliver more tangible benefits. Q: According to reports, on February 22, French President Emmanuel Macron promised that he is going to take measures to prevent foreign investors from buying French farms, and these measures are related to concerns that Chinese businesses are purchasing French agricultural land at cheap prices. What is your response to that? A: I am not aware of the specifics of the relevant business cooperation. The Chinese government always asks its enterprises to observe laws and regulations when expanding markets overseas. We also hope that the relevant party could provide an enabling environment and a level-playing field for Chinese enterprises' investments and operations there and contribute to the sound development of bilateral economic cooperation and trade. Q: According to the Reuters, a senior US official said that Australia, the United States, India and Japan are talking about establishing a joint regional infrastructure scheme as an alternative to China's Belt and Road Initiative. What is your comment? A: The Belt and Road Initiative proposed by China is meant to realize development for all by strengthening infrastructure and connectivity and fully tapping into the growth potential of all economies. Following the principle of shared benefits through extensive consultation and joint contribution since its inception five years ago, the Belt and Road Initiative has achieved fruitful outcomes in its pursuit for win-win results. With its positive effects felt so extensively, this Initiative has won widespread popularity. When representatives from more than 140 countries gathered in Beijing for the International Cooperation Forum of the Belt and Road Initiative in May, 2017, it was clear that this Initiative had won the vote of confidence from the international community. We have said many times that any country, as long as they share the same principle and vision, could take part in this open and inclusive initiative if they want to, including those mentioned by you. One last point I want to make is that infrastructure is an important driving force for economic development. We welcome larger inputs into the infrastructure field from other countries. All countries should strengthen such kind of international cooperation under the principle of openness, inclusiveness and mutually beneficial cooperation so as to promote regional and global economic development for the benefit of all. Q: According to a US website, during President Trump's visit to China last year, a scuffle broke out between Chinese and US security officials. Can you confirm this and what is your comment? A: We have taken note of this report. I know that the relevant authority on the US side has clarified the situation, saying that the report is false. I want to point out that President Trump's state visit to China last November was a great success. The working teams of the two sides closely communicated and coordinated with each other in a friendly and highly effective way before and during the visit. The two sides are quite satisfied with each other's work.